Today in Ghana, I had a personal reminder as to why our work to prevent disease is so perilous, and why disease control so promising in Africa. Visiting the storied Princess Marie Louise Children's Hospital in Accra, I watched as an eight-month-old boy, Isiah, struggled against severe pneumonia. Isiah was receiving supplemental oxygen from a cylinder, yet was still struggling to breathe. Even on oxygen therapy, his saturation was terribly low and his prognosis was poor. But mostly, I watched Isiah's father. He shook his son -- not roughly, but just enough to keep him from closing his eyes -- and he shouted at him with encouragement, urgency and longing, not reproach. I couldn't understand his language, but as a father of two kids myself, I could not help but put myself in his shoes. I imagined he was imploring his boy to stay alive, to fight a little longer, and to stay strong so he could return home, grow bigger, and live to see another birthday. In the United States, we can practically start planning our kids' birthdays from the day they come home from the hospital; deaths in childhood are quite rare. In Ghana, though, you can't take a child's fifth birthday for granted. Last year approximately 50,000 young children -- nearly seven out of every 100 -- died before their fifth birthday. This fact is unimaginable for those of us lucky enough to have children in the United States. If we in the U.S. had the same rate of child mortality as Ghana, 300,000 children would die annually. That's the equivalent of half of the children in New York City dying before their fifth birthday every single year. 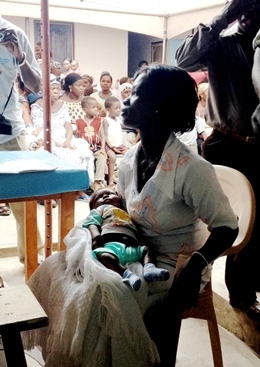 Joseph, the first Ghanaian baby to receive pneumococcal and rotavirus vaccinations at the same time, held by his mother. I also saw the promise of prevention in Ghana. Today, I visited a clinic where children were receiving pneumococcal and rotavirus vaccines, together for the first time in Africa. With support from the GAVI Alliance, Ghana is the first country in Africa to introduce two new vaccines against pneumonia and diarrhea at the same time. Together these deadly conditions claimed the lives of nearly 10,000 Ghanaian children last year, or about 20% of the child deaths overall. These vaccines against pneumococcal and rotavirus infections will prevent the most common causes of serious pneumonia and diarrhea. Before I arrived, I worked with our team at IVAC to project the health and economic impacts of this effort. We projected that by scaling up these new vaccines, Ghana can prevent 14,000 child deaths and 1.4 million illnesses in the decade ahead, and avert more than $300 million in economic losses in the process. My work requires me to know these statistics chapter and verse. But today, seeing Isaiah and his father imploring him to stay alive, I'm reminded that the most important benefit for Ghanaian families from this day is simply this -- the chance to celebrate more fifth birthday parties. Postscript: Today, I learned that Isiah lost his struggle against pneumonia late yesterday. My heart goes out to his parents for their suffering.